Good morning, dear friends!My hubby and I have been very creative lately. Our kitchen has become a laboratory where culinary experiments take place. I love sharing ideas with him and creating yummy stuff! Our last challenge was to veganize tiramisu. After two unsuccessful trials that ended up in garbage we finally made it! 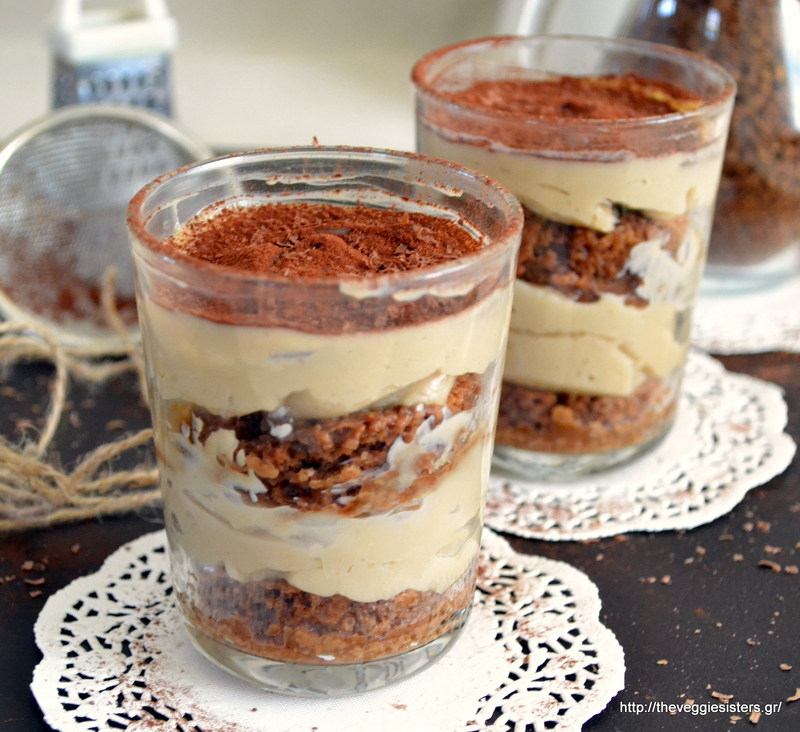 I am very happy to present our vegan tiramisu! Layers of a light sponge cake and yummy cream dusted with cocoa powder and scented with coffee. No eggs, no mascarpone or whipped cream. And yes, it is delicious! 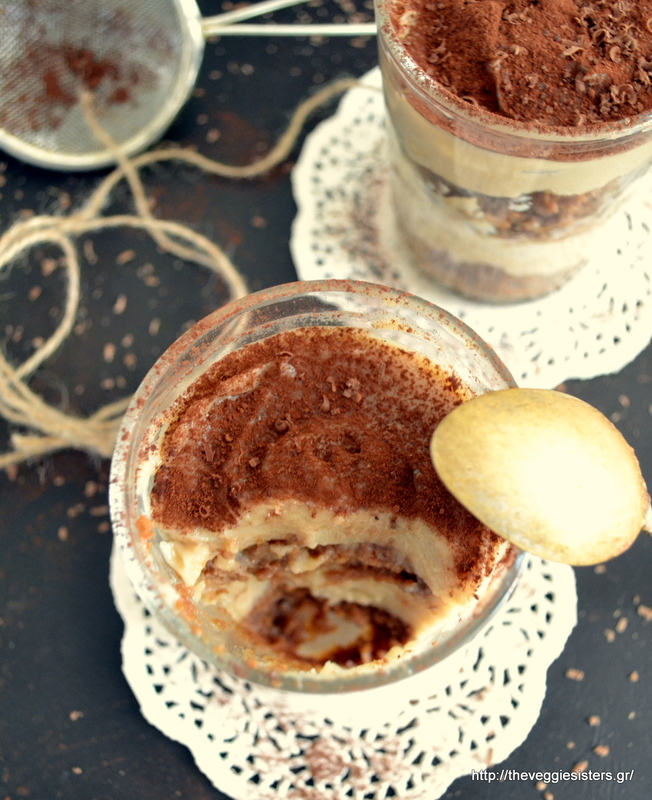 If you are looking for a vegan version of tiramisu, then this recipe calls your name, guys! Kisses and hugs! Happy new week! For the sponge cake: In a bowl combine flour with cocoa powder and baking powder (sieved). In another bowl beat milk with apple sauce, sugar, sunflower oil, 1tsp coffee+1/4 cup water. Put gradually the flour mixture into the wet mixture and stir to combine. Line a round cake pan with parchment, empty the batter, even it with a spatula. Bake in preheated oven at 180C for about 35-40 minutes. Remove from the oven and allow to cool. For the cream: Beat all the ingredients in a food processor until smooth. Then transfer in a deep pan and alow to warm up on high heat. Stir continously with a wooden spoon until the cream thickens. Remove from heat and allow to cool for 5 minutes. For the assembly: Cut the sponge cake in pieces (the size will be detrmined by the glasses you are going to use). Dip each piece in the cup of coffee (1 cup water+ 1 tsp coffee). Dont soak it, just dip it quickly so that it doesnt become very wet. Put it in the glass, then put 1-2 tsp of the cream. Continue with one more layer of sponge cake and cream. Put in the fridge for 1-2 hours. Before serving dust with cocoa powder. Enjoy! 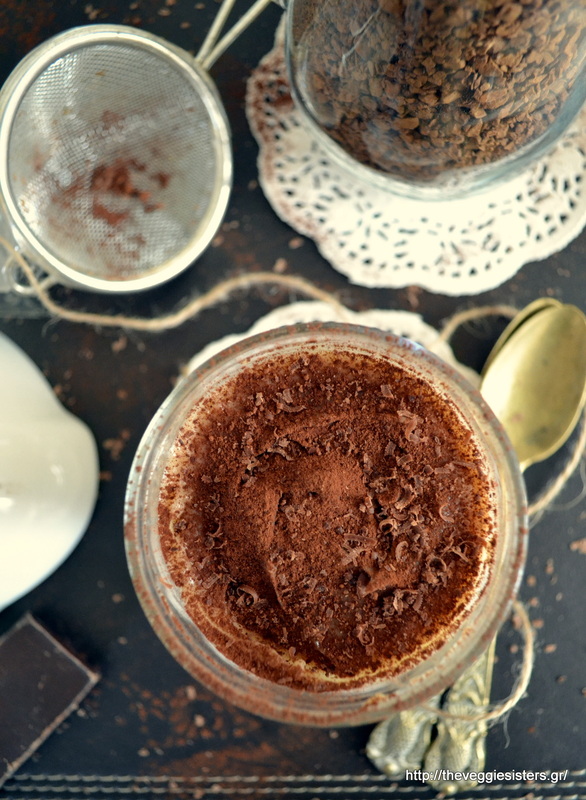 Share the post "Vegan Tiramisu"